Figure 7. 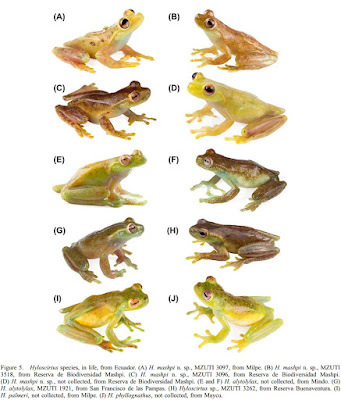 Colour variation in life of Hyloscirtus mashpi n. sp. at Reserva de Biodiversidad Mashpi, Ecuador. (A–D) Metamorphs. (E–G) Adult males. (H) Adult female. 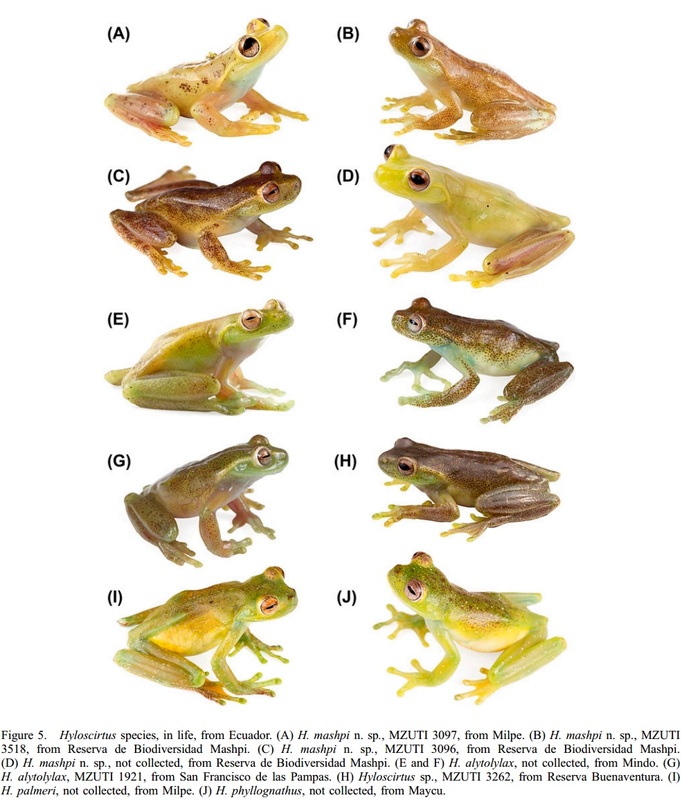 We present a new molecular phylogeny of the stream treefrog genus Hyloscirtus, with an improved taxon sampling in the Hyloscirtus bogotensis group. The tree supports the existence of three clades within the genus (Hyloscirtus armatus group, H. bogotensis group and Hyloscirtus larinopygion group) in congruence with previous studies, and suggests the presence of at least three new species in the H. bogotensis group. Herein, we describe one of these species, Hyloscirtus mashpi n. sp. from the Pacific slope of the Ecuadorian Andes. The validity of the latter is supported by molecular, morphological and acoustic data. We also tested individuals of the new species for the chytrid fungus Batrachochytrium dendrobatidis, finding a prevalence of 17.6% (6 positives and 28 negatives). 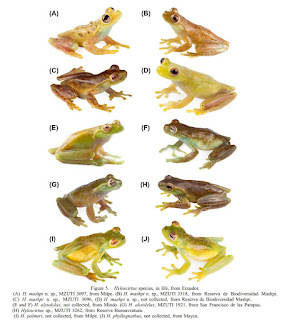 However, at sampled streams, frog densities were high, suggesting that H. mashpi n. sp. may be tolerant to the infection. Figure 7. 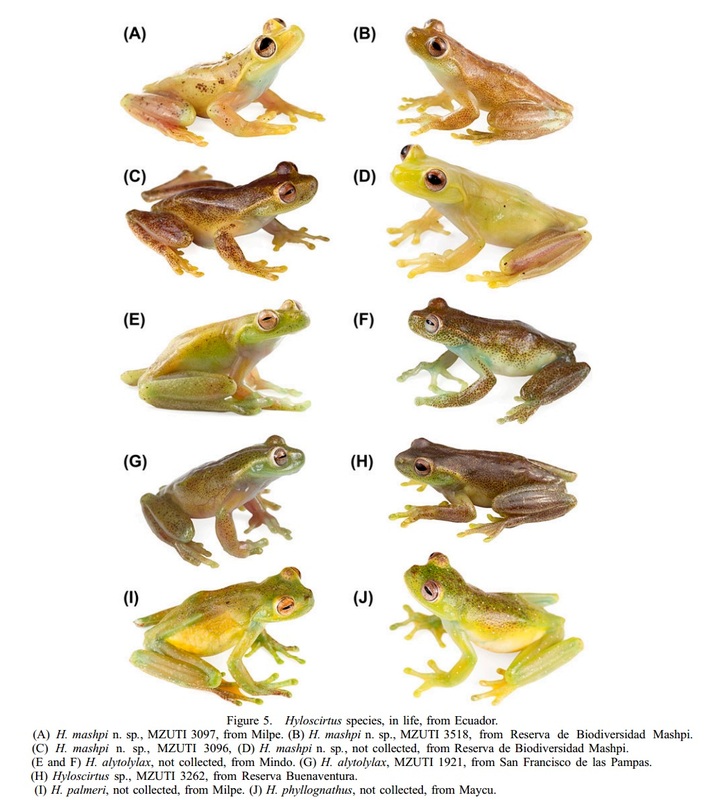 Colour variation in life of Hyloscirtus mashpi n. sp. at Reserva de Biodiversidad Mashpi, Ecuador. (A–D) Metamorphs. (E–G) Adult males. (H) Adult female. Figure 5. Hyloscirtus species, in life, from Ecuador. (A) Hyloscirtus mashpi n. sp., MZUTI 3097, from Milpe. (B) H. mashpi n. sp., MZUTI 3518, from Reserva de Biodiversidad Mashpi. (C) H. mashpi n. sp., MZUTI 3096, from Reserva de Biodiversidad Mashpi. (D) H. mashpi n. sp., not collected, from Reserva de Biodiversidad Mashpi. (E and F) H. alytolylax, not collected, from Mindo. (G) H. alytolylax, MZUTI 1921, from San Francisco de las Pampas. (H) Hyloscirtus sp., MZUTI 3262, from Reserva Buenaventura. (I) H. palmeri, not collected, from Milpe. (J) H. phyllognathus, not collected, from Maycu. Etymology. The specific epithet mashpi is used as a noun in apposition and refers to one of the localities where the species is found, Reserva de Biodiversidad Mashpi, a protected area where research and conservation efforts are carried out by Reserva de Biodiversidad Mashpi S.A., Universidad Tecnológica Indoamérica, Tropical Herping and other institutions. The word mashpi is a Yumbo word that means ‘friend of water’, which is a precise description of this treefrog, which is always found along pristine streams. Se presenta una nueva filogenia de las ranas torrentícolas del género Hyloscirtus, la cual incluye un muestreo ampliado del grupo H. bogotensis. El árbol apoya la presencia de tres clados dentro del género (Grupo H. armatus, Grupo H. bogotensis, Grupo H. larinopygion) y sugiere la existencia de tres especies nuevas. En el presente estudio describimos una de estas especies, Hyloscirtus mashpi n. sp., distribuida en la vertiente pacífica de los Andes del Ecuador. La validez de la nueva especie se sustenta en datos moleculares, morfológicos y acústicos. Nuestro estudio también demuestra que la nueva especie está infectada por el quítrido Batrachochytrium dendrobatidis; sin embargo, las poblaciones son abundantes, sugiriendo que H. mashpi n. sp. tolera la infección. 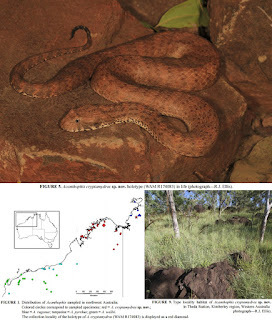 Australian death adders (genus Acanthophis) are highly venomous snakes with conservative morphology and sit-and-wait predatory habits, with only moderate taxonomic diversity that nevertheless remains incompletely understood. Analyses of mitochondrial and nuclear gene sequences and morphological characteristics of death adders in northern Australia reveal the existence of a new species from the Kimberley region of Western Australia and the Northern Territory, which we describe as Acanthophis cryptamydros sp. nov. Although populations from the Kimberley were previously considered conspecific with Northern Territory death adders of the A. rugosus complex, our mtDNA analysis indicates that its closest relatives are desert death adders, A. pyrrhus. We found that A. cryptamydros sp. nov. is distinct in both mtDNA and nDNA analysis, and possesses multiple morphological characteristics that allow it to be distinguished from all other Acanthophis species. This study further supports the Kimberley region as an area with high endemic biodiversity. FIGURE 5. 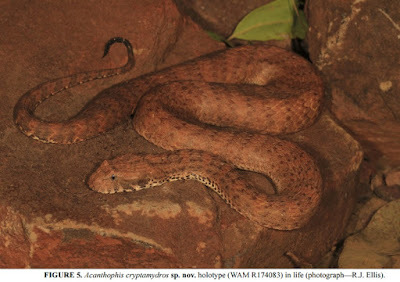 Acanthophis cryptamydros sp. nov. holotype (WAM R174083) in life, collected 1 km north-west of Theda Station homestead, Western Australia (photograph—R.J. Ellis). Distribution. Acanthophis cryptamydros sp. nov. is known from the Kimberley region of Western Australia. The species’ range in Western Australia is known to extend from Wotjulum (WAM R11241) in the west, 45 km north-north-east of Halls Creek in the south (WAM R70690), and Kununurra in the east (WAM R137470). Acanthophis cryptamydros sp. nov. is also known to occur on some offshore islands including Koolan, Bigge, Boongaree, Wulalam, and an unnamed island in Talbot Bay (Palmer et al. 2013). A single specimen (NTM R29109) with incomplete data (no collection date or precise latitude and longitude) is reported as occurring from Adelaide River in the Northern Territory (Fig. 1); however, this locality may be in error. Further collecting from the area may resolve the issue. Habitat and ecology. The holotype (WAM R174083) was collected early morning towards the end of the ‘wet season’ (early March) from among basalt boulders in savannah woodland at the edge of a low plateau near a small sandstone outcrop. Vegetation among the basalt boulder habitat was dominated by Eucalyptus tectifica and Corymbia greeniana amongst mixed shrubs over mixed groundcovers and annual/perennial grasses (Fig. 9). Shrub cover was dominated by Grevillea mimosoides, Grewia retusifolia, Indigofera sp. and Olearia arguta (Fig. 9). The specimen was observed retreating to grass tussocks after being disturbed. The specimen was tightly coiled within the grass tussock before attempting to move to another tussock when disturbed. WAM R145216 was collected from thick grasses on a creek bank subjected to minor sheet flooding at Little Mertens Falls. Collection notes and accession data of other specimens describe individuals collected from among grasses or leaf litter in sandstone habitats. One specimen was collected from under a rock in a vine thicket near a beach on an unnamed island in Talbot Bay (WAM R172034), and another from leaf litter in Acacia woodland on Wulalam Island (WAM R172035). Two specimens were collected from roads or tracks (WAM R70690, WAM R165567). Remarks. The A. rugosus group is likely to contain a number of undescribed species. Taxonomic resolution of this group will further define differences between individual species within the group and A. cryptamydros sp. nov. The discovery of A. cryptamydros sp. nov. as a previously undescribed major lineage within Acanthophis highlights the incompleteness of our understanding of phylogenetic structure and species limits within the genus. At the same time, it also highlights the importance of the Kimberley region of Western Australia as a center of endemism (Doughty 2011; Oliver et al. 2012; Pepper & Keogh 2014). Lethal ingestion of the cane toad (Rhinella marina) has been documented in previous studies on Acanthophis specimens from the Kimberley region and Northern Territory (Phillips & Shine 2007; Hagman et al. 2009; Phillips et al. 2010; Pearson et al. 2014) indicating the species is likely to be at risk of significant decline as cane toads continue to move west across the Kimberley region. A detailed assessment on potential threats to the species including cane toads will identify the need for listing as a species requiring protection under state or federal legislation. FIGURE 1. Distribution of Acanthophis sampled in northwest Australia. Only samples with accurate collection coordinates have been included, except specimen NTM R29109 (star; see text). Colored circles correspond to sampled specimens: red = A. cryptamydros sp. nov.; blue = A. rugosus; turquoise = A. pyrrhus; green = A. wellsi. The collection locality of the holotype of A. cryptamydros (WAM R174083) is displayed as a red diamond. FIGURE 9. Type locality habitat of Acanthophis cryptamydros sp. nov. in Theda Station, Kimberley region, Western Australia (photograph—R.J. Ellis). 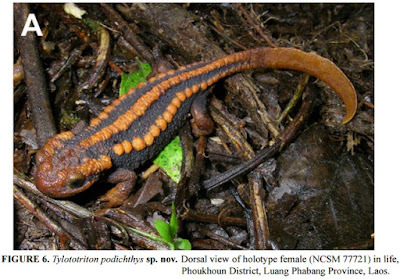 The salamandrid genus Tylototriton is poorly known in Laos, with one described species and unverified reports of two others. 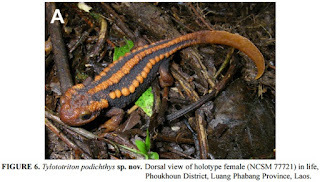 We undertook new fieldwork and obtained samples of Tylototriton at six localities across northern Laos during 2009–2013. Bayesian phylogenetic analysis of mitochondrial DNA, principal component analyses of 13 mensural characters, and qualitative morphological comparisons with samples from across the geographic range of Tylototriton were performed. Samples from Laos fell into four molecular and morphological groups, consisting of T. notialis, T. panhai, T. anguliceps, and a fourth lineage that is hypothesized here to be an undescribed species. Tylototriton podichthys sp. nov. is distinguished from its congeners by having distinct mitochondrial DNA haplotypes and in characteristics of the glandular skin on the head and body, shape of the rib nodules, and coloration of the body and limbs. This study expands the number of confirmed Tylototriton species in Laos from one to four, with the description of one species and extension of the ranges of T. panhai and T. anguliceps to Laos. An improved understanding of the geographic ranges of T. podichthys sp. nov. and T. anguliceps within Laos is needed. 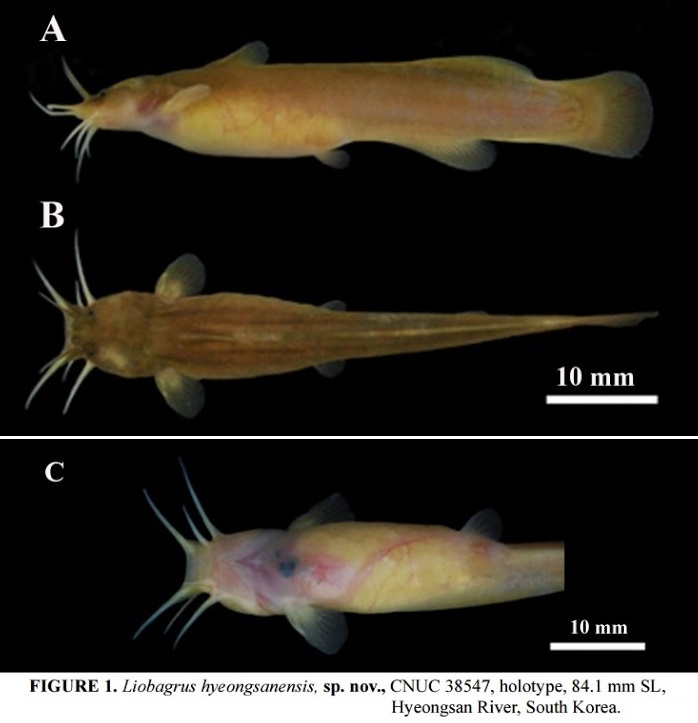 Tylototriton verrucosus verrucosus (part) Le, Nguyen, Nishikawa, Nguyen, Pham, Matsui, Bernardes & Nguyen 2015: 39. Subgenus: The new species is assigned to the subgenus Tylototriton Dubois & Raffaëlli 2009 (= T. verrucosus species group of Fei et al. 2005) based on its phylogenetic position (Fig. 1) and having orange coloration on limbs and lateral surfaces of tail (Nishikawa et al. 2014). Etymology. The specific epithet is a noun in apposition taken from pod Gr., foot, and ichthys Gr., fish, in reference to the Lao language name pa theen, ປາຕີນ, meaning “fish with feet,” that is widely used for newts (Tylototriton and Laotriton) in Laos. Diagnosis. Tylototriton podichthys sp. nov. is a Tylototriton (subgenus Tylototriton) having the combination of an indistinct glandular ridge on midline of crown; distinct, rounded rib nodules with diameter equivalent to or greater than that of eye; parotoid oriented parallel to body axis in lateral view; thick, glandular, vertebral tubercular ridge; rough, glandular skin on cranial crest; uniformly orange cranial crest and parotoids; orange markings separated between rib nodules; dark coloration on ventral surfaces of limbs; and dark coloration on digit tips. A new species of torrent catfish, Liobargus hyeongsanensis, is described from rivers and tributaries of the southeastern coast of Korea. The new species can be differentiated from its congeners by the following characteristics: a small size with a maximum standard length (SL) of 90 mm; body and fins entirely brownish-yellow without distinct markings; a relatively short pectoral spine (3.7–6.5 % SL); a reduced body-width at pectoral-fin base (15.5–17.9 % SL); 50–54 caudal-fin rays; 6–8 gill rakers; 2–3 (mostly 3) serrations on pectoral fin; 60–110 eggs per gravid female. Gyeongsangbuk-do, South Korea: Upper Hyeongsan and Taehwa Rivers (Fig. 4). Sexual dimorphism. The adductor mandibulae in males is greatly expended during the spawning season, from late April to June. Etymology. Named after the Hyeongsan River, the type locality. We propose the Korean name Donbang-Jagasari for this species. Biology and habitat. Liobagrus hyeongsanensis is small, nocturnal and benthic. It inhabits the bottom stratum of running waters with moderately fast currents, in upper streams and valley streams. It is generally seen in shallow waters (0.3–0.8 m deep) with large or small stony or pebbly substrates. The spawning season is from late April to June. The adult females do not exceed 90.0 mm SL and lay a small number of eggs (60–110), 2.8–3.3 (3.1±0.2) mm in diameter. Fig. 4. Live photo of the holotype of Panaqolus nix (INPA 39606; 110.1 mm SL). Fig. 3. Variation in the color of Panaqolus nix: a) nearly white specimen (UFRO-I 10050, 90.4 mm SL) b), intermediately colored specimen (UFRO-I 7968, 81.4 mm SL) (Photos by B. S. F. Barros). The rio Madeira is the largest white-water tributary of the Amazon, and is currently the river drainage with the highest fish species diversity in the world. 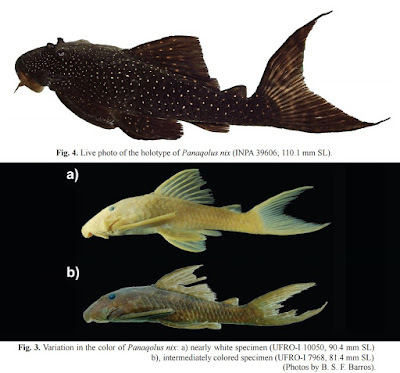 A new species of Panaqolus was recognized from the middle Madeira and Mamoré rivers (Brazil) and from the Madre de Dios drainage (Peru) and it is described herein. This new species is readily distinguished from its congeners by the large number of white dots distributed all over the body and by its remarkable amplitude of color pattern variation, ranging from a pale, light brown, to dark brown and almost black background coloration. 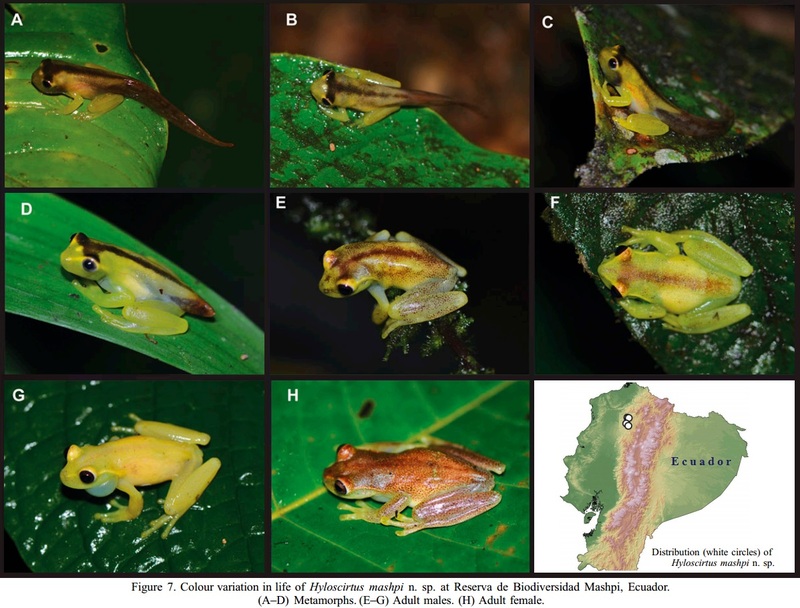 The new species closely resembles P. albomaculatus but has more and smaller dots on the body, a smaller orbital diameter (12.5-16.8% head length vs. 16.0-20.0%) and longer maxillary barbels (9.7-19.6% head length vs. 1.6-8.9%). 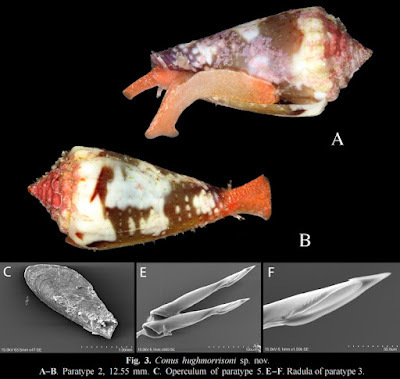 The new species is the second of the genus Panaqolus described for a Brazilian location after nearly 80 years of the description of P. purusiensis. Distribution and Habitat. The known distribution of this species is the Madeira basin, including the Madeira, Mamoré, and Tambopata (Madre de Dios drainage) rivers (Fig. 6). Most of the specimens have been collected in cofferdams at the construction sites of the hydroelectric power plants of Santo Antônio and Jirau (former Santo Antônio and Jirau rapids), on the rio Madeira, by several technicians and ichthyologists hired by the two Consulting Environmental Companies responsible for the biological inventories in the area. Most of the remaining specimens have been caught in depths of 3.1 to 11 m (UFRO-I 6384, INPA 39605, MZUSP 114009) and 4.1 to 8.5 m (UFRO-I 6384) using trawl nets. This indicates that this species prefers deep-water habitats with strong current, which might help to explain its relative rarity in scientific collections. Etymology. From the Latin nix meaning snow, alluding to the color: in dark individuals the dots look like falling snowflakes, while pale individuals look like they have the whole body covered by snow; treated as a noun in apposition. Panaqolus nix shows a remarkable plasticity in coloration: the base coloration can be uniformly yellowish-white, pale brown, or dark brown to nearly black. Specimens that showed a light coloration when collected, changed to a nearly black coloration when in an aquarium. Panaqolus nix showed a color pattern very different from most of its congeners that present a color pattern with bands or saddles. 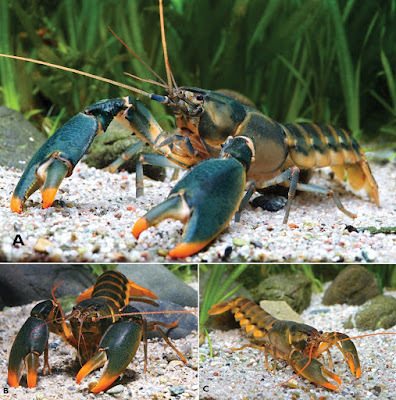 The other Panaqolus species with uniform coloration are P. nocturnus, from Peru, Río Marañon basin, and large P. purusiensis, from upper rio Purus. Panaqolus nix is the first species of the genus reported to be caught using trawl nets and also the first that seems to have a preference for deeper habitats. Besides, P. nix is the species in the genus with the smallest eyes what might be related to its capacity to explore deeper benthonic habitats. The other Panaqolus species with small orbits is P. purusiensis. However, P. nix has a more elongate body and shallower caudal peduncle depth, whereas P. purusiensis present a more robust and truncate body form. Schaefer & Stewart (1993) called attention for the reduced number of vertebrae in the holotype of P. purusiensis (26 vs. 28 in all other species of Panaqolus) and that the holotype showed some sort of teratology. However, the authors also remark that morphometric proportions related to caudal peduncle length did not differ between the holotype and the topotype. Young and subadult P. purusiensis are also reported as presenting bands on body and fins, differently from P. nix. Panaqolus nocturnus is also close to P. nix but it differs from the latter by the larger orbit and completely lack of clear dots along body and fins. Coloration, presence of caudal-fin filaments and the angle between the dentary tooth rows suggest that P. nix is closely related with P. albomaculatus and P. albivermis. However, P. albomaculatus has a larger orbit, fewer teeth and shorter barbels than P. nix, whereas P. albivermis shows a quite conspicuous and peculiar color pattern with thin light transversal lines on body and fins. In the aquarium hobby, P. nix has been introduced as Panaqolus sp. L395, having been found in the Madre de Dios basin in Peru (Evers, 2005). O rio Madeira é o maior afluente de água branca do rio Amazonas e é atualmente o rio com o maior número de espécies do mundo. Uma nova espécie de Panaqolus foi reconhecida do médio rio Madeira, do rio Mamoré (ambos no Brasil) e da bacia do Río Madre de Dios (Peru) e é descrita aqui. Esta nova espécie se distingue de suas congêneres pela grande quantidade de pontos brancos espalhados pelo corpo e grande variabilidade na sua coloração, variando de um fundo branco a marrom claro até marrom escuro e quase preto. A espécie se assemelha a P. albomaculatus da qual se distingue por ter mais manchas de menor tamanho no corpo, olhos menores (12,5-16,8% do comprimento da cabeça vs. 16,0-20,0%) e barbilhões maxilares mais compridos (9,7-19,6% comprimento da cabeça vs. 1,6-8,9%). A nova espécie é a segunda de Panaqolus descrita para uma localidade no Brasil, aproximadamente 80 anos após a descrição de P. purusiensis. Figure 5: Typical Indo-Pacific humpback dolphins with unspotted and spotted bodies. 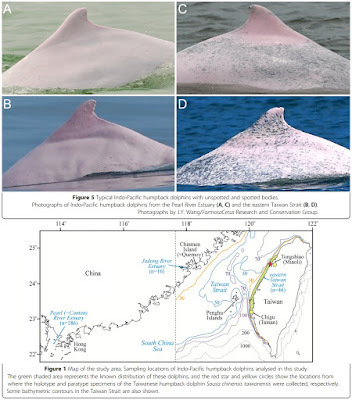 Photographs of Indo-Pacific humpback dolphins from the Pearl River Estuary (A, C) and the eastern Taiwan Strait (B, D). Photographs by J.Y. Wang/FormosaCetus Research and Conservation Group. Figure 1: Map of the study area. Sampling locations of Indo-Pacific humpback dolphins analysed in this study. The green shaded area represents the known distribution of these dolphins, and the red star and yellow circles show the locations from where the holotype and paratype specimens of the Taiwanese humpback dolphin Sousa chinensis taiwanensis were collected, respectively. Some bathymetric contours in the Taiwan Strait are also shown. Subspecies recognition can affect how people (scientists and non-scientists alike) view organisms and thus has important implications for research on, as well as the conservation of, these entities. Recently, a small group of Indo-Pacific humpback dolphins was discovered inhabiting the waters off central western Taiwan. This geographically isolated population possesses pigmentation patterns that are subtly, but noticeably, different from their nearest conspecifics in the neighbouring waters of the Jiulong River Estuary and Pearl River Estuary of mainland China. Due to this population’s low and declining numbers and the numerous threats it faces, it was assessed as critically endangered by the Red List of Threatened Species of the International Union for Conservation of Nature. The purpose of this study is to examine the degree of differentiation of the Taiwanese population to determine if subspecies recognition is warranted. 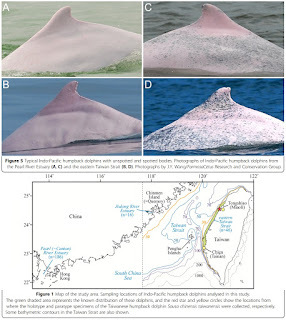 Analysis of the degree of differentiation in pigmentation patterns revealed nearly non-overlapping distributions between dolphins from Taiwanese waters and those from the Jiulong River + Pearl River estuaries of mainland China (the nearest known populations). The Taiwanese dolphins were clearly diagnosable from those of the Jiulong River + Pearl River estuaries under the most commonly accepted ‘75% rule’ for subspecies delimitation (with 94% of one group being separable from 99+% of the other). Evidence of geographical isolation and behavioural differences also provided additional support for the distinctiveness of the Taiwanese dolphins. 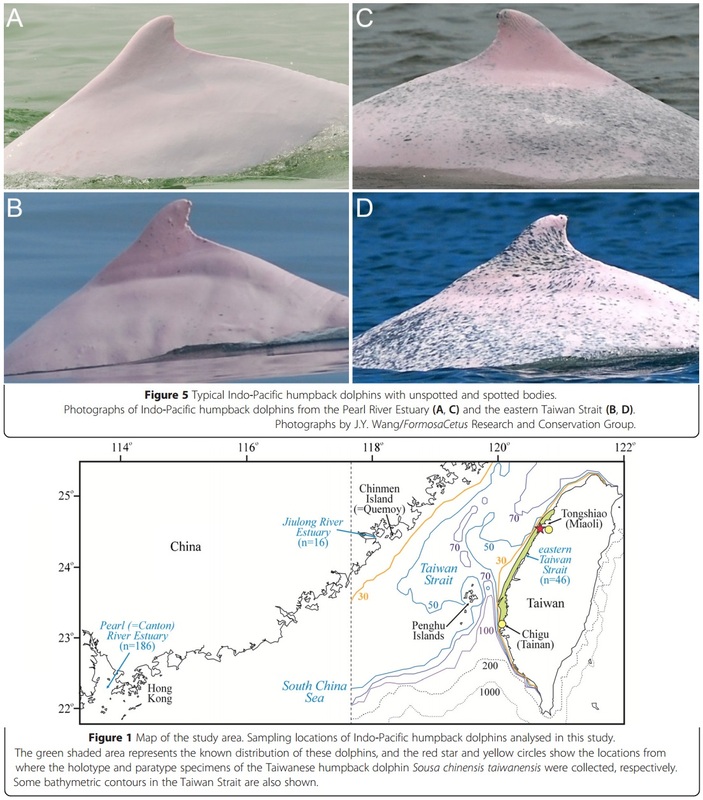 Together, the evidence strongly demonstrated that the Taiwanese humpback dolphin population is differentiated at the subspecies level and on an evolutionary trajectory that is independent from that of dolphins from adjacent waters of mainland China (i.e. Jiulong River + Pearl River estuaries). As a result, the taxonomy of Sousa chinensis was revised to include two subspecies: the Taiwanese humpback dolphin, Sousa chinensis taiwanensis subsp. 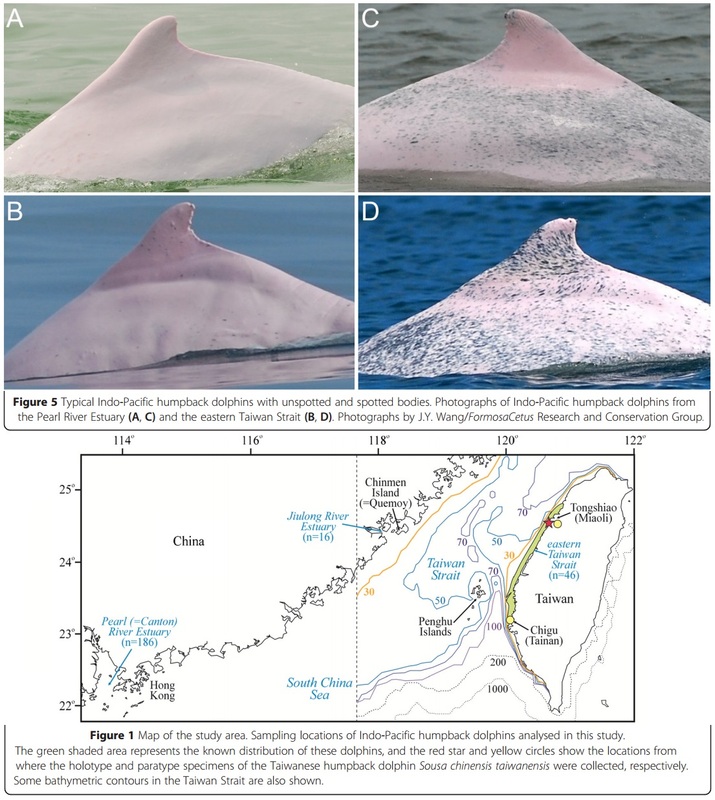 nov., and the Chinese humpback dolphin, Sousa chinensis chinensis (the nominotypical subspecies). These subspecies are described, and the holotype and paratype specimens for S. c. taiwanensis are established. Type locality: The species was first described from observing dolphins swimming in the Canton (=Pearl) River Estuary. Swinhoe’s specimen that was described by Flower (1870) was collected from the waters of Quemoy (presently known as Chinmen Island) in the Jiulong River Estuary, which is roughly 500 km northeast of the Pearl River Estuary. Etymology: The ‘chinensis’ name refers to the general location from where the species was originally described. To maintain consistency with the scientific name of the subspecies, we suggest the following common names: Chinese humpback dolphin or the Chinese white dolphin (a direct translation of the most common local moniker, ‘Zhonghua bai hai tun’). We recognize that before the present revision, Chinese white dolphin referred to the species. To avoid confusion, we recommend that Indo-Pacific humpback dolphin be retained as the common name for the species (following Jefferson and Rosenbaum 2014) while Chinese humpback dolphin or Chinese white dolphin is used in reference to the nominotypical subspecies S. c. chinensis. This nomenclatural arrangement should facilitate increased local acceptance and usage of the Indo-Pacific humpback dolphin name for the species because it does not negate the local common name for the local animals and would also allow easier (and logical) accommodations for any future subspecies that may be found within S. c. chinensis without the need to change the species’ common name. Distribution: The nominate subspecies is found from the Yangtze River Estuary in central China south through Southeast Asia (east to at least Borneo) and extending west throughout the northern rim of the Indian Ocean to at least Orissa, India (Jefferson and Rosenbaum 2014). There appears to be at least eight major concentrations of this subspecies in the coastal waters of China (Jefferson 2000; Jefferson and Hung 2004), but others will almost certainly be found throughout the species’ distribution. Further subspecies divisions are probable. Type locality: The specimen was found stranded on a beach of Tongshiao, Miaoli County (Taiwan) on 25 September 2009. The specimen’s condition was fresh (code 2 of Geraci and Lounsbury 2005) and highly emaciated and showed clear signs of net entanglement (around the tail stock, flukes, rostrum, flippers and possibly the dorsal fin) that likely resulted in her death. Etymology: The proposed subspecies name reflects the endemic distribution of the subspecies in the waters of western Taiwan and in the same flavour as other endemic subspecies of Taiwan. Similar to the common names for S. c. chinensis, we suggest Taiwanese humpback dolphin or Taiwanese white dolphin, which is the direct translation of a local common name, ‘Taiwan bai hai tun’. Distribution: This subspecies is endemic to the shallow coastal waters of central western Taiwan (=eastern Taiwan Strait) including the waters of Miaoli, Taichung, Chunghua, Yunlin, Chiayi and Tainan counties. Dolphins have been reported from as far north as the waters influenced by the Zhonggang and Houlong rivers and south to the waters influenced by the Tzengwen River (near Chigu, Tainan County). With the exception of the intertidal waters inshore of large sandbars of Changhua County, they are generally found less than 3 km from the shore, in waters <30 m deep, and tend to be more commonly observed in and near estuaries (Dares et al. 2014). The known area occupied by this subspecies is about 600 km2 , but the full distribution is likely larger, extending potentially further north to the influences of the Danshuei River Estuary, where suitable habitat appears to be present (Wang et al. 2007a; Ross et al. 2010). 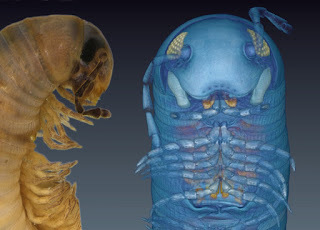 An image of the 3D, micro-CT-generated avatar next to a preserved specimen of Ommatoiulus avatar. The species takes its name from its computer-generated avatar. We review the state-of-the-art approaches currently applied in myriapod taxonomy, and we describe, for the first time, a new species of millipede (Ommatoiulus avatar n. sp., family Julidae) using high-resolution X-ray microtomography (microCT) as a substantive adjunct to traditional morphological examination. 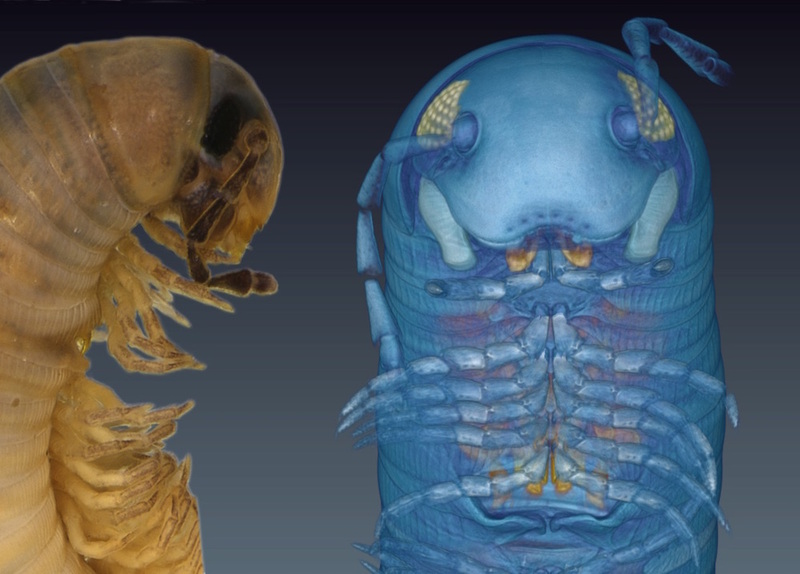 We present 3D models of the holotype and paratype specimens and discuss the potential of this non-destructive technique in documenting new species of millipedes and other organisms. The microCT data have been uploaded to an open repository (Dryad) to serve as the first actual millipede cybertypes to be published. Ommatoiulus avatar Akkari and Enghoff n. sp. Diagnosis :Most similar to Ommatoiulus bavayi (Brölemann, 1897), with which it agrees in the shape of promerite and mesomerite and the way they fit closely together; also in the sinuous paracoxite. The two species differ, however, in the shape of the solenomerite, much broader and with a distal lamella in the new species, vs. with obviously narrower processes in Ommatoiulus bavayi. The paracoxite is much more serrated, broader and complex in the new species than in Ommatoiulus bavayi. Etymology: In computing, an avatar is the digital representation of the user or the user's alter ego or character. The name here refers to the cybertype, which is a graphical representation of the physical holotype. 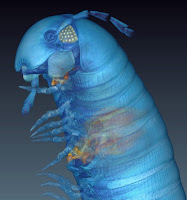 The micro-CT provides a detailed view of the male centipede's gonopods (red and yellow) body parts used in reproduction. 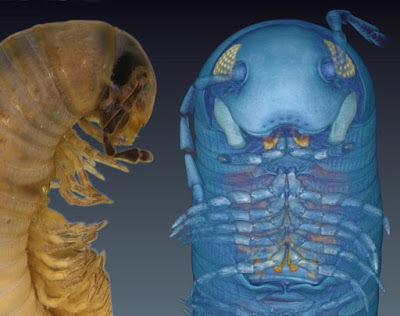 Millipedes often have distinct gonopods, allowing researchers to identify newfound species by looking at the gonopods' unique structures. Fig 2. Ommatoiulus avatar n. sp. Volume rendering highlighting genitalia and other sexual characters in the cybertypes. (A) Holotype male with highlighted gonopods, first pair of legs and mandibular stipites. 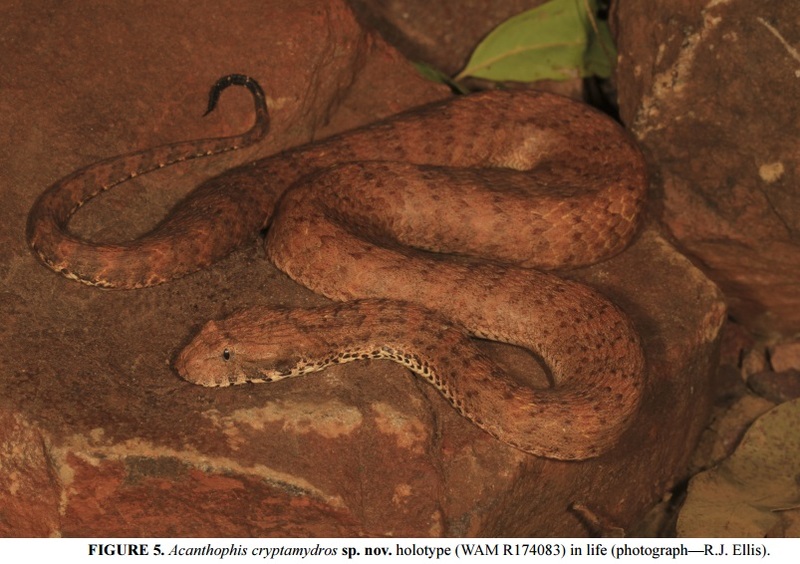 (B) Paratype female with highlighted vulvae and eggs. Images not to scale. 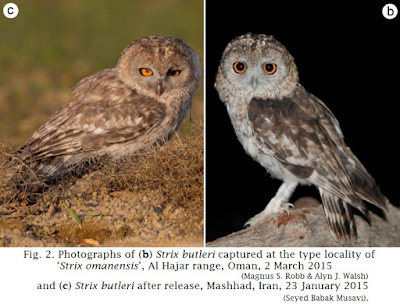 (b) Strix butleri captured at the type locality of ‘Strix omanensis’, Al Hajar range, Oman, 2 March 2015 (Magnus S. Robb & Alyn J. Walsh). Background: Most species of owls (Strigidae) represent cryptic species and their taxonomic study is in flux. 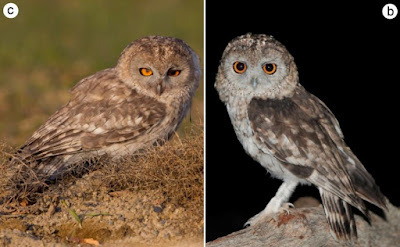 In recent years, two new species of owls of the genus Strix have been described from the Arabian peninsula by different research teams. It has been suggested that one of these species, S. omanensis, is not a valid species but taxonomic comparisons have been hampered by the lack of specimens of S. omanensis, and the poor state of the holotype of S. butleri. Methods: Here we use new DNA sequence data to clarify the taxonomy and nomenclature of the S. butleri complex. We also report the capture of a single S. butleri in Mashhad, Iran. Results: A cytochrome b sequence of S. omanensis was found to be identical to that of the holotype of S. butleri, indicating that the name S. omanensis is best regarded as a junior synonym of S. butleri. The identity of the S. butleri captured in Mashhad, Iran, was confirmed using DNA sequence data. This represents a major (1,400 km) range extension of this species. Conclusions: The population discovered in Oman in 2013 and originally named ‘S. omanensis’ actually represents the rediscovery of S. butleri, which was known from a single specimen and had not been recorded since 1878. The range of S. butleri extends into northeast Iran. Our study augments the body of evidence for the recognition of S. butleri and S. hadorami as separate species and highlights the importance of using multiple evidence to study cryptic owl species. Figure 1. Cherax snowden sp. n.
A paratype male (MZB Cru 4292) from Oinsok River drainage, Sawiat District B male from aquarium import (not listed in material examined) from Indonesia C Paratype female (MZB Cru 4293) from a unnamed tributary of the Oinsok River drainage. A new species, Cherax snowden sp. 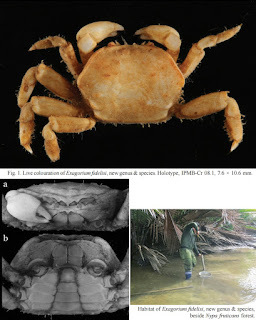 n., from the Oinsok River Drainage, Sawiat District in the central part of the Kepala Burung (Vogelkop) Peninsula, West Papua, Indonesia, is described, figured and compared with the closest related species, Cherax holthuisi Lukhaup & Pekny, 2006. This species is collected and exported for ornamental purposes and its commercial name in the pet trade is “orange tip” or “green orange tip”. Both species may be easily distinguished morphologically or by using sequence divergence, which is substantial, for considering C. snowden sp. n. to be a new species. Etymology: The new species is named after the american freedom fighter Edward Joseph Snowden. He is honored due to of his extraordinary achievements in defense of justice, and freedom. The name is used as a noun in apposition. Known only from tributary creeks to the Oinsok River, Sawiat District in the central part of the Kepala Burung (Vogelkop) Peninsula. The creeks from where these crayfish have been collected are shallow (20–60 cm) with a moderate flow, the water is clear, and has a pH of approx. 6.5. In most of the parts no water plants are present. The substrate of the creek is rocky, mostly covered with silt, stones and larger rocks..To improve the knowledge of the distribution of the species more collecting trips are necessary. It is also necessary to briefly comment on the possible threats faced by the new species. As C. snowden sp. n. is collected in large numbers for the global aquarium trade, as well as for food for the growing local population, the crayfish population will invariably be adversely impacted. According to local collectors, the populations of the species have been decreasing in the last few years. Clearly, the continued collectiing of these crayfish for the trade is not a sustainable practice, and if the popularity of the species continues, a conservation management plan will have to be developed, potentially including a captive breeding program. 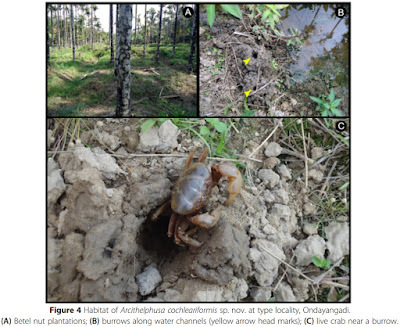 Freshwater crabs of the Western Ghats have been severely underestimated in their diversity. Since freshwater crabs have a small spatial scale endemism, many remote and poorly studied localities in the Western Ghats need to be surveyed. In this study, a new genus and new species is described. Arcithelphusa cochleariformis gen. et sp. nov. is described from Ondayangadi, Wayanad district, Kerala, India. The new genus and new species is exceptional among Indian freshwater crabs due to its squarish, highly arched carapace, appearing box-like in frontal view, and long, stout, spoon-shaped male first gonopod. 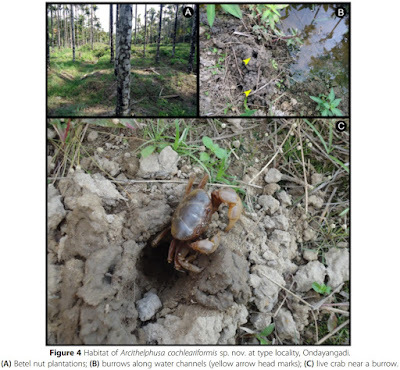 With the current discovery, 14 genera and 36 species of gecarcinucid freshwater crabs are recognized in the Western Ghats of India. More new taxa can be expected from this exceptionally biodiversity-rich area if the necessary surveys are done. Figure 4: Habitat of Arcithelphusa cochleariformis sp. nov. at type locality, Ondayangadi. A new genus and new species of the family Camptandriidae Stimpson, 1858, are described from Lower Kinabatangan-Segama Wetlands, Sabah, Malaysia. Exagorium fidelisi, new genus & species, can be distinguished from known camptandriid genera and species by the characters of the carapace, male abdomen and male first gonopod. Type species. Exagorium fidelisi, new species, by present destination. Gender neuter. Etymology. The genus name “Exagorium” is derived from an arbitrary combination of hexagonal shape of the carapace of the type species (L. exagonum) and a suffix for the type genus of the family Camptandriidae “-rium”. Etymology. The species name is dedicated to Fidelis Edwin Bajau, Deputy Director (Development) of the Sabah Forestry Department, who has facilitated and encouraged the authors’ study to a great extent. Ecological note. 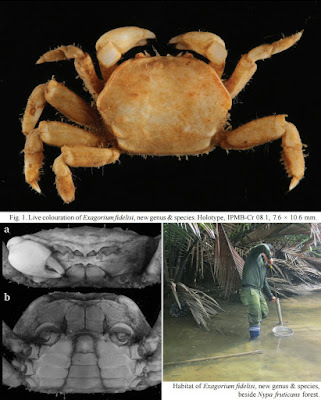 Exagorium fidelisi, new species, was pulled up by a yabbie pump from small vertical burrows that were observed on the surface of muddy sediment with depths of 10–30 cm during low tide. It was found beside the Kulamba River, dominated by the clump-forming palm, Nypa fruticans (Fig. 6). Tohru Naruse, Arthur Y. C. Chung and Joseph Tangah. 2015. Description of A New Genus and A New Species of the Family Camptandriidae Stimpson, 1858 (Crustacea: Decapoda: Brachyura) from Lower Kinabatangan-Segama Wetlands, Sabah, Malaysia. RAFFLES BULLETIN OF ZOOLOGY. 63: 327–333. Fig. 3. Conus hughmorrisoni sp. nov.
A–B. Paratype 2, 12.55 mm. C. Operculum of paratype 5. E–F. Radula of paratype 3.
describe a new species of cone snail, Conus hughmorrisoni sp. nov., from the vicinity of Kavieng, New Ireland, Papua New Guinea. 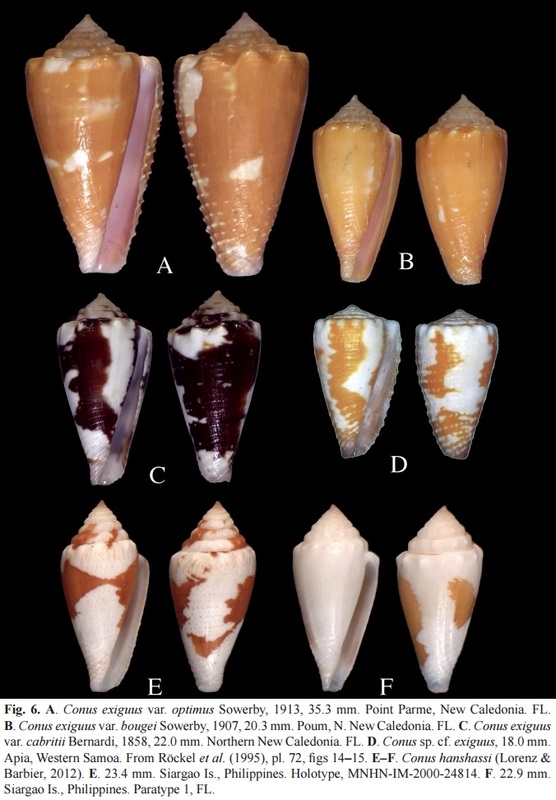 It closely resembles the New Caledonian C. exiguus and the Philippine C. hanshassi, but differs from these species by having more numerous shoulder tubercles, by the shell’s sculpturing and details of the color pattern. We also sequenced a fragment of the mitochondrial COI gene of five specimens collected alive. 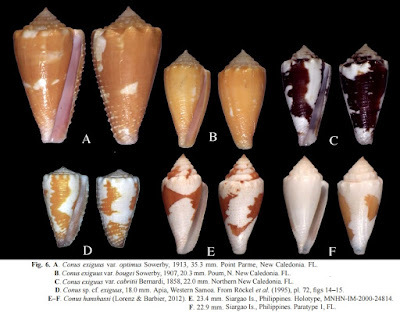 All possessed very similar sequences (genetic distances < 0.3%), different from all the COI sequences of cone snails available in GenBank (genetic distances > 10%). Keywords. COI mitochondrial gene, Conidae, Conus hughmorrisoni sp. nov., new species, New Ireland. Conus (Splinoconus) hughmorrisoni sp. nov. Type locality: Papua New Guinea, New Ireland, Kavieng Lagoon, E side of Wadei Island, 02°40.3’S, 150°39.1’E, 9–11 m deep (station KR70). Fig. 6. A. Conus exiguus var. optimus Sowerby, 1913, 35.3 mm. Point Parme, New Caledonia. FL. B. Conus exiguus var. bougei Sowerby, 1907, 20.3 mm. Poum, N. New Caledonia. FL. C. Conus exiguus var. cabritii Bernardi, 1858, 22.0 mm. Northern New Caledonia. FL. D. Conus sp. cf. exiguus, 18.0 mm. Apia, Western Samoa. From Röckel et al. (1995), pl. 72, figs 14–15. E–F. Conus hanshassi (Lorenz & Barbier, 2012). E. 23.4 mm. Siargao Is., Philippines. Holotype, MNHN-IM-2000-24814. F. 22.9 mm. Siargao Is., Philippines. Paratype 1, FL. Felix Lorenz and Nicolas Puillandre. 2015. Conus hughmorrisoni, A New Species of Cone Snail from New Ireland, Papua New Guinea (Gastropoda: Conidae). Figure 6. (A) Holotype of Cryptotriton xucaneborum in life. (B) Ventral view of holotype showing dark grey ventral coloration. (D) View of type locality of C. xucaneborum, showing small forest fragment surrounded by agricultural land. (E) Habitat where holotype of C. xucaneborum was collected. 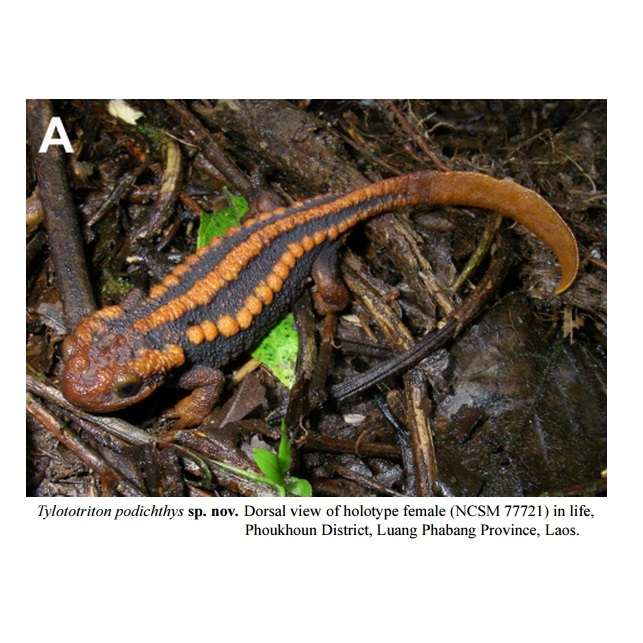 The cloud forests of Mesoamerica are notable for their high endemism, and plethodontid salamanders provide a striking example of divergence and microendemism across cloud forest blocks at a regional level. 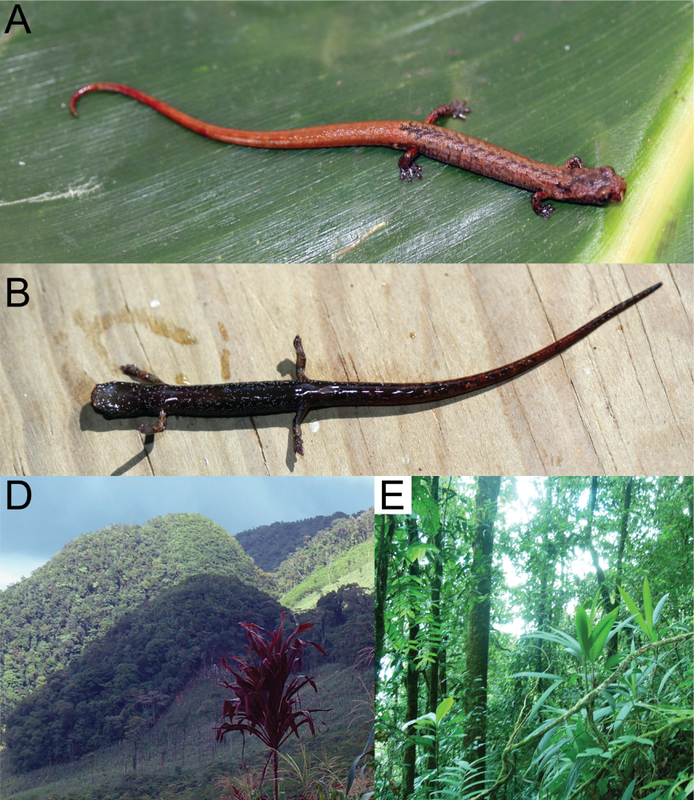 Salamanders that make use of arboreal bromeliad microhabitats in the cloud forest appear to be especially prone to divergence driven by natural habitat fragmentation, and are expected to show high endemism at small spatial scales. We use a multilocus dataset to investigate the biogeographic history and relationships among species of a small genus of salamander, Cryptotriton, restricted to the cloud forests of Nuclear Central America. We use a morphological data set along with a coalescent species delimitation method to reveal the presence of at least one undescribed species from an isolated cloud forest in eastern Guatemala. Biogeographic analyses show that Cryptotriton has a different biogeographic history than another clade of cloud forest-restricted salamanders in the same region, perhaps indicating that each genus restricted the spatial expansion and diversification of the other through preemptive occupancy. Our results suggest that isolation across relatively short geographic distances has led to range fragmentation and deep divergence between species. Exploration of remaining patches of cloud forest likely will continue to reveal undetected diversity. Figure 6. (A) Holotype of Cryptotriton xucaneborum in life. (B) Ventral view of holotype showing dark grey ventral coloration. (C) Ventral view of an individual of Cryptotriton veraepacis (USAC 1920) showing lighter grey ventral coloration. (D) View of type locality of C. xucaneborum, showing small forest fragment surrounded by agricultural land. (E) Habitat where holotype of C. xucaneborum was collected. Habitat and distribution. – Known only from two localities separated by 22 km in the Sierra de Xucaneb, Alta Verapaz, Guatemala. The species may occur at a few other points of relatively high elevation in the Sierra de Xucaneb, but extensive deforestation in most areas has eliminated what may have once been suitable habitat for the species. The holotype was found in an arboreal bromeliad, while the four paratypes from Chelemhá were found active at night on vegetation 1–2 m above the ground. The forest at Finca Volcán represents a transition from lower elevation forest to cloud forest, with relatively few bromeliads and other epiphyte growth, and is classified as subtropical rainforest (Holdridge, 1967), while habitat at Chelemhá is lower montane rain forest (Holdridge, 1967) with typical cloud forest vegetation and extensive epiphyte cover. 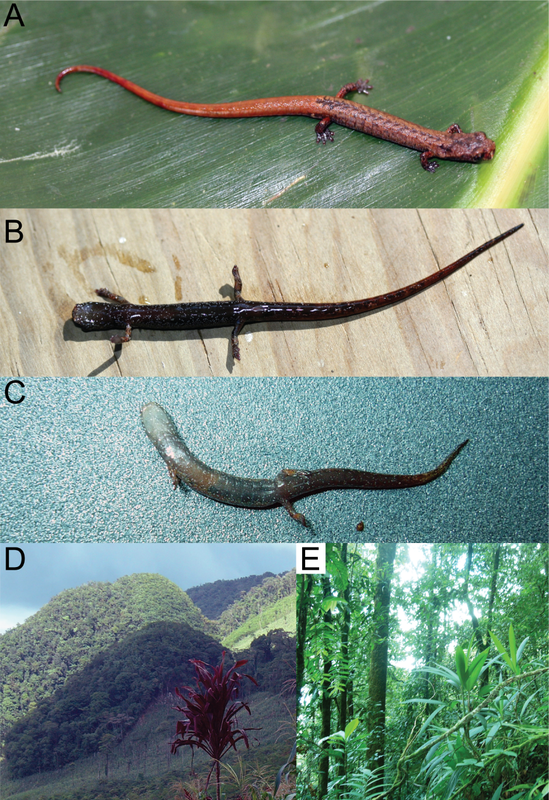 The only syntopic species of salamander known to occur with Cryptotriton xucaneborum is Bolitoglossa helmrichi, which occurs at both known sites. ป้ายกำกับ: 2015, Biogeography, Caudata - Salamander, Central America, Evolution, Guatemala, Herpetology - Frog; Reptile Snake, Montane, Neotropical, Neotropical Amphibian, Plethodontidae, Toponym, Zool. J. Linn. Soc.